Which means the next two months of my life will be spent in a turkey-and-christmas-cookie-fueled daze. 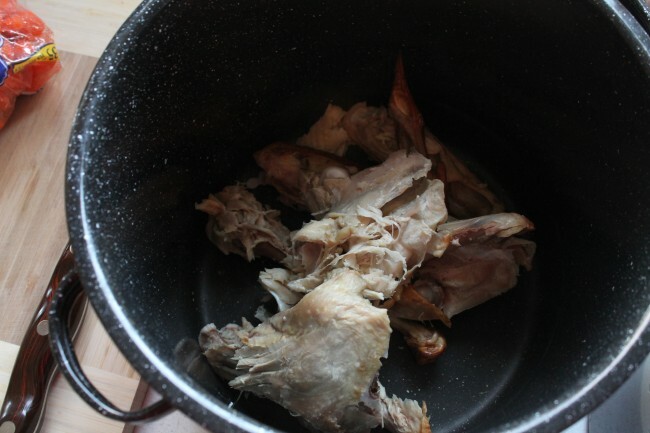 Thankfully, turkey carcasses can turn into a great turkey stock. Are you a vegetarian? Just eliminate the turkey from this recipe. 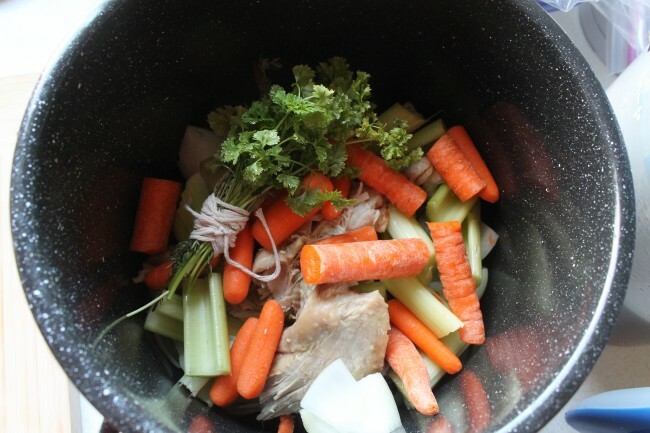 You’ll still be left with a great and flavorful stock. 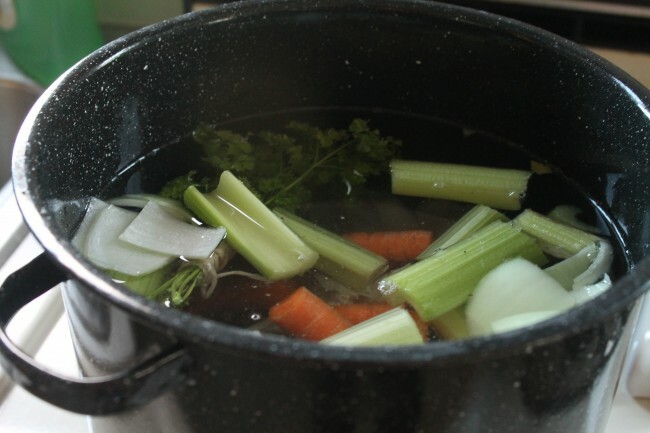 Making your own stock is great for a few reasons. 1. It makes your house smell ah-freakin-mazing. 2. You control the flavor and – more importantly – the amount of salt that goes into your stock. Store-bought varieties are notorious for being high in sodium, and when you flavor it yourself you can make sure your stock doesn’t ooze salt. 3. Bragging rights. 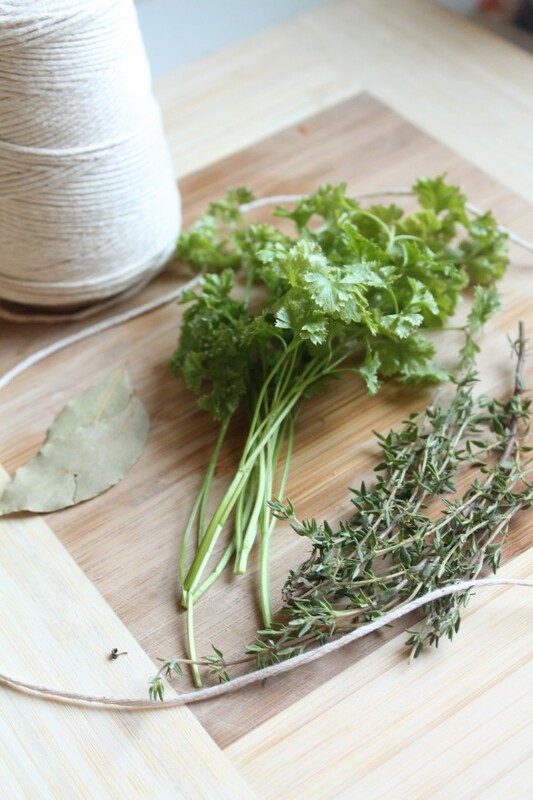 Making your own stock from scratch is COOL. 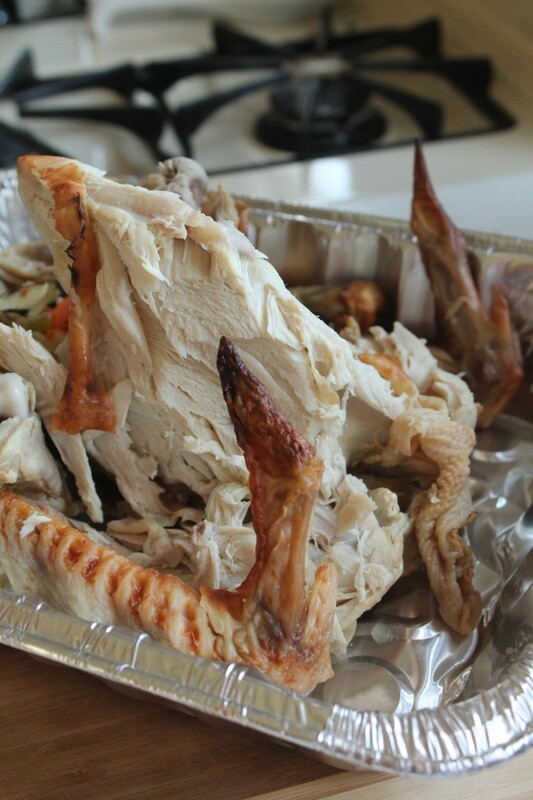 Bones and a little meat of 1 turkey: Mine was about 12 lbs…if you have a giant turkey, you can split it up between two batches or double the recipe. You can use plain bones if you want, but I like to leave a few meat scraps in there because it adds deeper, roasted-turkey-ish flavor. Take any meat you want to save off the turkey bones. Chop the rest up into pieces that will fit in a large pot. Throw those in the pot. 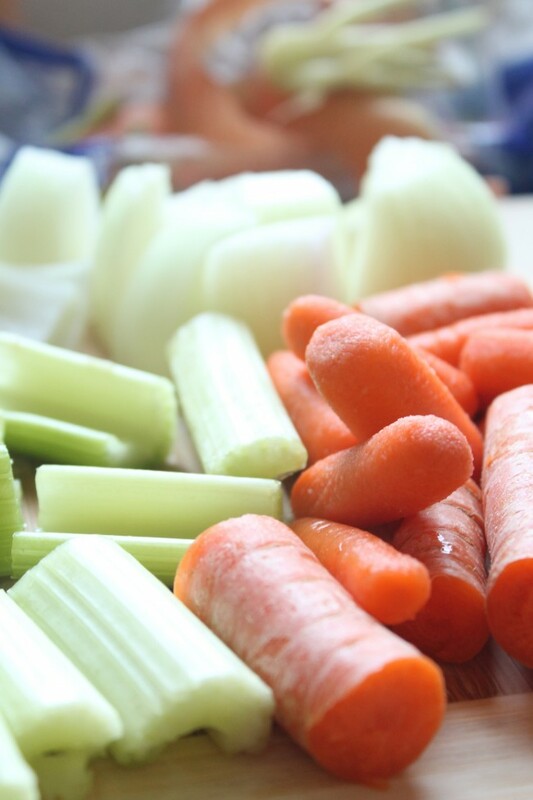 Add chopped carrots, onion, and celery to the pot. 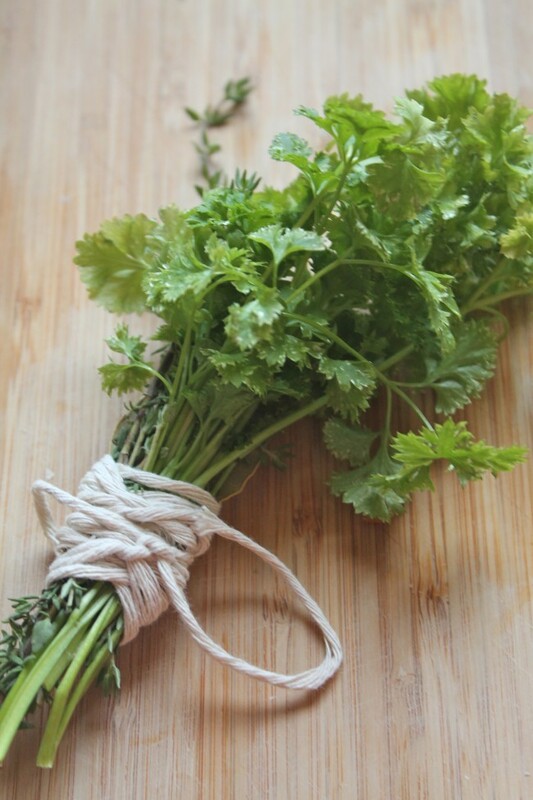 Tie bay leaves, parsley, and thyme together with kitchen twine to make a bouquet garni. Throw that in the pot. Sprinkle salt over stock ingredients. Add the water to the pot and bring to a boil. When mixture boils, reduce heat to medium-low and simmer, partially covered, for at least two hours (I usually simmer mine for four or more). Stir every 45 minutes or so – this can sit on the stove largely unattended. If any fat has risen to the top as you stir, skim it off with a spoon and discard. When stock is done, remove from heat and let cool for 20 minutes before you strain it. Pour stock, turkey, and veggies through a mesh strainer (the small openings help catch all the stuff you threw in the stock). Make sure you have a big bowl under the strainer to catch all the stock! Stock will keep in the fridge for 4-5 days (longer if you take it out every 3rd day and boil it again, which will keep it from spoiling, but that’s a lot of work) or in the freezer for a few months. Do you think it’s a good idea, if one decides to freeze, to freeze by the cup? So one only needs to thaw the exact amount? Absolutely! I usually freeze 2-3 cups in each container, so that I can defrost the perfect amount for a soup recipe all at once. 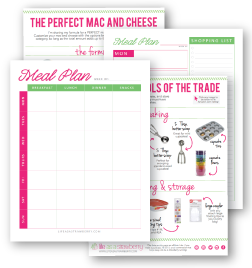 It helps to have anything you freeze pre-measured to eliminate hassle when you defrost and cook!